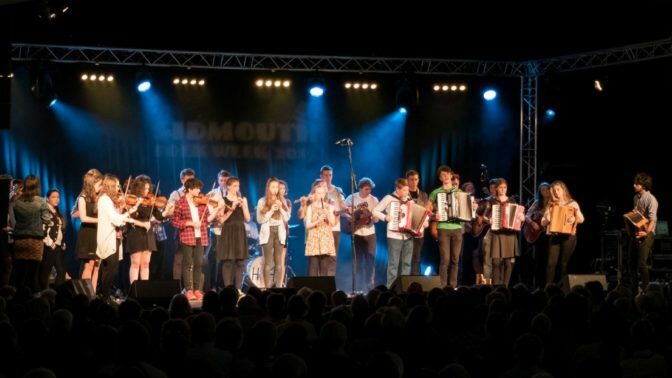 An opportunity for young musicians from the South West and beyond to work with leading folk artists, to create a new performance piece – and to perform it live at Sidmouth Folk Week! The young performers will operate as a company: taking warm ups together, technique classes in their disciplines, learning repertoire and creating contemporary reinterpretations of traditional material. The group will live, work and play together, with opportunities for informal rehearsals and social gatherings to enrich their experience and understanding of the folk arts. This is a fun but intensive course for young people aged 12-18, leading to a day of performances at Sidmouth Folk Week. It’s designed as a progression from our Spring Halsway Young Folk Intro Week, but if you’re new to Halsway, that’s ok; you’ll need prior experience as a musician or singer, and to have some folk experience, eg from taking part in workshops at Festivals, from going to courses at other venues, from playing in a school (or your own!) folk band. If you’re not sure, then get in touch. Places costs £225. Accomodation, all meals, tuition and activities are included in the price. Transport to Sidmouth is NOT included; parents will need to collect participants on Saturday morning and accompany them to the Festival for the day. Places are limited and will be allocated on a first come, first-served basis. Contact us for an application form, or download an application form here. Please return your completed application form with a deposit of £60 to secure your place. This will be Jim’s third year as a member of the Young Halsway tutors’ team. Claire has been involved with the young people’s programme at Halsway from the very beginning in 2010, predominately as a pastoral tutor. We expect a large uptake for this course and will bring in additional tutors to ensure a tutor:student ratio of 1:10 or thereabouts.